← Mayor grilled by five year olds. Details at 11:00! This post by blogger Rachel was originally published on GGC’s Patrol blog, a place for teen girls to have their say and connect with other young women in Guiding. I hope you’ve all heard by now that Canada is about to have a federal election. There’s less than a month of campaigning left before voting takes place on May 2. Now, I’m no expert on politics, but I’m pretty interested in what’s going on. Since January of this year there’s been a lot of speculation about whether or not there’d be an election in the spring, and I had my fingers crossed that there wouldn’t be. This wasn’t because I’m a fan of our last government, by any means – I was just hoping an election would be avoided until after my 18th birthday, so that I could vote. I wasn’t that lucky. I’m one month and 17 days too young. This unfortunate situation, plaguing every 17-year-old with an interest in government born after May 2, 1993, has gotten me thinking about who has the right to vote. Many of my friends are able to head to the polls in a few weeks, just because of when they were born. Am I not as qualified to vote for who I want as my MP? In those 48 days in between the election and my birthday, am I suddenly going to gain the maturity needed to make a conscious, informed decision? Is everyone under the age of 18 without the mental capacity to correctly fill in a ballot? I certainly hope not. As much as I’d love to be able to vote in this election, I do see the problem of lowering the age restriction. I think it’s fair to say that teenagers aren’t very politically informed, and who knows how many would vote if given the chance. The benefit of having one clear-cut restriction on voting is understandable, even if it is frustrating beyond belief right now. In the end, I guess there’s no ideal solution to my voter age problem. Luckily for me there’s a provincial election in Ontario coming up in October in which I’ll finally be eligible to vote – but some of my friends born late in the year will still be “too young”. I could’ve said a lot more on the subject in this post, but I’d rather hear what you have to say! Post a comment with your thoughts and opinions on voter age. Equal Voice, a national multi-partisan organization advocating for the election of more women, has launched a national initiative, Take a Girl to Vote, in partnership with Girl Guides of Canada, Apathy is Boring, the Canadian Women’s Foundation, the Girls Action Foundation, The Historica-Dominion Institute and the YWCA. Press Release: National Council of Women of Canada (NCWC) Urges Women to Vote May 2nd. 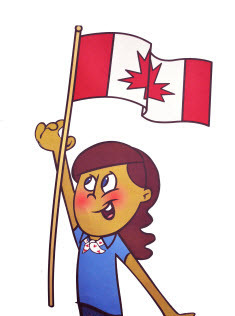 This entry was posted in Girls' Guides and tagged civics, election, vote. Bookmark the permalink.